What is the difference between a “blog” and a “wiki”? 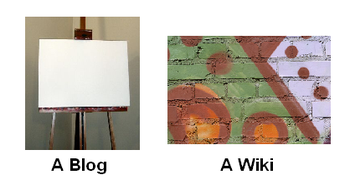 What’s the Difference between a Blog and a Wiki? Blog – a Talk Show with call-in guests (e.g., Bill O’Reilly) — while guests and callers can comment on the conversation, at the end of the day — it’s Bill’s show. 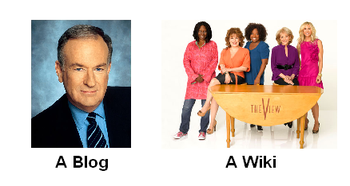 Wiki – a Talk Show with a panel (e.g., The View) — Everyone contributes to the conversation. Blog – a boardroom table with a podium at the head of the table. Wiki – a boardroom table that’s round. One way to describe the difference is that a blog is a flow of thought or thoughts shared by one or more individuals with others commenting on those thoughts, whereas a wiki is a repository of thoughts or information with others modifying or contributing to the library of thoughts. posted under Blog Info, wikis | Comments Off on What is the difference between a “blog” and a “wiki”?